There was a new world record for a woodcut from Albrecht Durer’s Apocalypse series at Christie’s in New York. 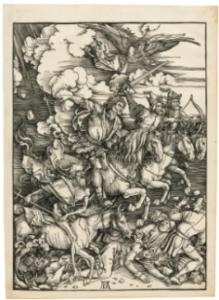 Durer’s The Four Horsemen of the Apocalypse made $612,500 against a high estimate of $350,000. It was the top lot at Christie’s Old Master Prints sale which realised $4.89 million. Other great results were achieved for Saint Jerome reading in an Italian Landscape by Rembrandt ($468,500) and Martin Schongauer’s The Death of the Virgin from The Collections of Herschel V. And Carl W. Jones, Minneapolis which achieved $492,500, setting a new record price for the artist. Further artist records were set for the Master E.S., whose Madonna of Einsiedeln: Large Version, also from the Jones collection, achieved $372,500, and Israhel van Meckenem’s Bust of an Oriental Man, which sold for $81,250. Another record was achieved for a print by Jean-Etienne Liotard, whose Large Self-Portrait sold for $75,000. The auction was sold 76% by lot and 93% by value. This entry was posted on Monday, February 4th, 2019 at 2:16 am	and is filed under ART, AUCTIONS. You can follow any responses to this entry through the RSS 2.0 feed. You can leave a response, or trackback from your own site.